It has been WAY too long since I’ve touched on ‘My Favourite Things’ post series – so here we go. Today’s gift ideas are all around a particular colour (or shade, if you will) that makes an appearance in the classic lyrics. However, for a fun twist, I’m also incorporating a fair number of items that also bring to mind that ‘other’ definition of cream; that is, the yummy food product, particularly in ICE cream format. And with that, let’s dive in. Cream is sort of a tough colour to define, but to me it’s that sort of warmer tone of off-white; kind of a vanilla, heritage shade if you will, the kind you associate with petticoats and handkerchiefs. 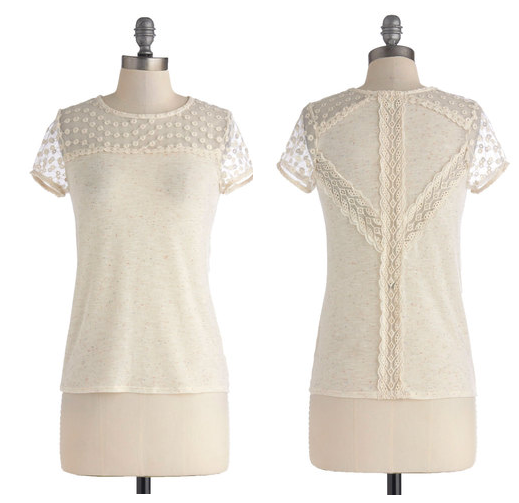 This elegant yet daytime-appropriate top brings to mind those same Victorian notes thanks to the delicate floral lace yoke and the embroidered stripes along the back. If you’re going for an ice creamy confection, you’re in luck; the fabric of this top is also dotted with tiny, sprinkle-like rainbow specks. When you’re a kid, and even as an adult, one of the questions that most frequently pops up is ‘Vanilla or Chocolate?’ A lot of people pick on plain ol’ vanilla, but I have a confession: over the years I’ve evolved from a diehard chocolate crusader to an absolute adorer of all things vanilla. What’s particularly versatile about this core baking ingredient is the fact it can liven up just about any sweet dish, but can also sneak its way into more savoury items as well. This creamy-white, vanilla-focused cookbook is definitely more on the sweeter side of things, with recipes for dreamy glazed vanilla bean doughnuts, malted white hot chocolate, and even vanilla-infused liquors. Plus, vanilla devotees will love the tasting notes for various forms of vanilla and a thorough history on this sacred bean’s back story. Admittedly the *colour* of this kitchen appliance is definitely white as opposed to ‘cream’, but the fact it whips up soft-serve ice cream with your choice of mix-ins in as little as 20 minutes is a pretty big saving grace, if you ask me. If, come summertime, your simply drool at the sight of a classic swirly cone of vanilla froyo, ice cream, or even gelato, this is totally the spin-on-an-ice-cream-maker you should be adding to your gift list, stat! If your absolute favourite scent is that of creamy vanilla, then you’ll definitely want to indulge in this fat-free cologne spray. A single spritz should uplift even the darkest spirits as you inhale tones of rich, bright, and inviting vanilla. For those not in the know, the idea behind Demeter Fragrance Library is to mimic everyday scents (including some more obtuse choices like humidor, fiery curry, and dirt). They aren’t necessarily the type of thing you spray on and smell all day – just keep your fave fragrance handy and give it a quick spray whenever you want a ‘taste’ of a signature scent. You can order anything from Demeter online, but a large selection of their 30 mL sprays (as pictured above) are available at Loblaws / Real Canadian Superstore locations for just $15, making them a perfect birthday or bridesmaid pick. These days, virginal white isn’t exactly ‘en vogue’ on the wedding scene. Many brides looking to put a personal stamp on their big day are opting for gowns in slightly off-kilter shades of buttercream, silver, ice blue, and blush pink. This frothy, cream-coloured confection would make an amazing (and affordable) statement for any bride-to-be, but would work equally well for the younger set looking to get decked out for a prom or debut party of her own. 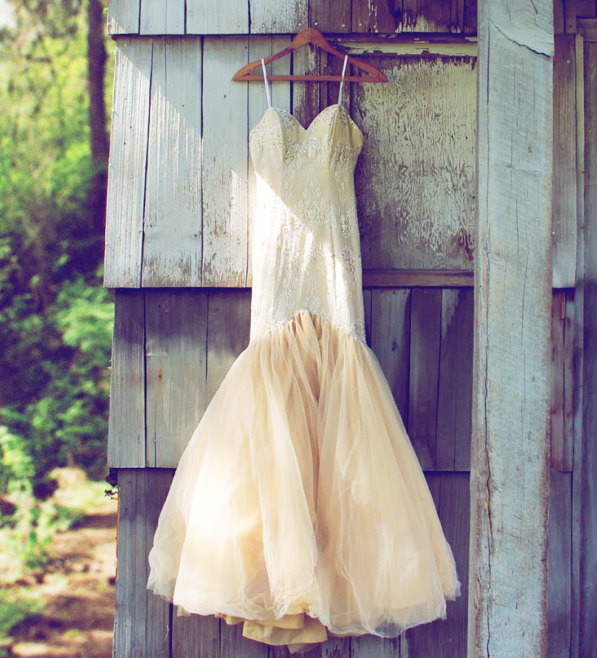 Moms pay attention: consider purchasing this pretty frock and watch your little girl’s eyes light up. There you have it! Five fun interpretations of ‘cream’ to suit the summer and the shade alike. Now I’ve got 3 great prize packages to give away to 3 of you; each one includes a copy of Pure Vanilla + a Vanilla Ice Cream cologne spray from Demeter Fragrance Library. Here’s how to enter! 1) Leave a comment by August 7th with your favourite featured ‘Cream’ gift idea AND who it’s for (yourself is okay). 2) Entries are limited to one per person / per email address / per household (or more if you score bonus entries). A random draw will be conducted on or around August 8th to select the winners, who will have 48 hours to respond before another winner is chosen in their place. 4) Bonus Entry: First, make sure you follow me on Twitter – @cdngiftguide. Second, tweet about this giveaway up to 3 times over the contest period (be sure to tag @cdngiftguide & leave a link back to your Tweet in the comments below) to earn up to 3 bonus entries. My preference would have to be the Demeter Vanilla Ice Cream Cologne Spray – for myself since vanilla is my favourite scent! The gift idea I really love is the Vanilla Ice Cream Cologne Spray. Yes, for me. I love having fragrance options. Spool Couture Pale Vine Dress – $184 @ Spool72 ! Love, love, love this dress for my daughter. My favourite gift is the Vanilla Ice Cream Cologne Spray and I would gift it to my daughter. I love the Cuisinart Soft Serve Ice Cream Maker… I’d like to say it’s for my kids, but let’s be honest here, this one’s for me! 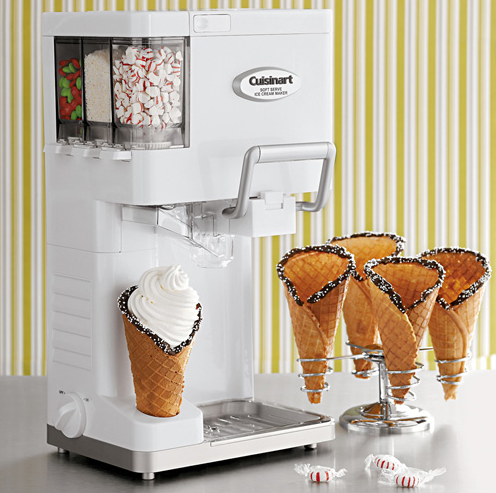 Love the Cuisinart Soft Serve Ice Cream Maker.Wouldn’t that be fun!!? The Cuisinart Mix-It-In Soft Serve Ice Cream Maker is off the hook! And I can’t believe how reasonably priced it is too. My favourite is the Cuisinart Mix-It-In Soft Serve Ice Cream Maker – I’d try to keep it for myself but when the grandkids see it I know it will end up with them. The Cuisinart Mix-It-In Soft Serve Ice Cream Maker would be fun to share. I would love this for myself and my family. I love the ice cream maker. Wow….what a great assortment of prizes…..if I won the ice cream maker, i would be a very popular grandma! Wonderful choices, however I would opt for the vanilla ice-cream cologne spray. mmmmm, def the soft serve ice cream maker! I love the ice cream maker! my daughters would love the vine dress! I love the Cuisinart Mix-It-In Soft Serve Ice Cream Maker. It would be a great gift for my son or for me! trying to lose weight buy the soft icecream maker surely would not help. Cuisinart Mix-It-In Soft Serve Ice Cream Maker – $119 @ CHEFS, I would love this as I could make Gluten Free ice cream! Vanilla Ice Cream Cologne Spray for me because my husband loves the smell. The Cuisinart soft serve ice cream maker. For my family – would be great for the kids and their friends! My favorite is the Vanilla Ice Cream Cologne Spray. Would be for me, but Vanilla is boyfriend’s favorite scent so sort of for him as well! Cuisinart Mix-It-In Soft Serve Ice Cream Maker – for anyone who comes over for a visit in the summer! I like the Vanilla Ice Cream Cologne Spray and I would give it to myself to try! The Cuisinart Soft icecream machine! My favourite featured ‘Cream’ gift idea is the Cuisinart Mix-It-In Soft Serve Ice Cream Maker. It would be for the whole family. We love our ice cream! My favourite is the Cuisinart Mix-It-In Soft Serve Ice Cream Maker. I would use it every time my family came to visit in the summer months … and throughout the year, too! I love the icecream maker,my husband would love this! I like the Best Ice Cream in Town Top for myself. Cuisinart Mix-It-In Soft Serve Ice Cream Maker is my favourite thing. My favourite featured ‘Cream’ gift idea would most definitely be the, “Cuisinart Mix-It-In Soft Serve Ice Cream Maker – $119 @ CHEFS” & yes it would be for ME! The Cuisinart Mix-It-In Soft Serve Ice Cream Maker looks great (and for a friend’s upcoming birthday). Thanks so much. I love the Best Ice Cream in Town top….gorgeous details! Cuisinart Mix-It-In Soft Serve Ice Cream Maker would be perfect for me and the family. Cuisinart Mix-It-In Soft Serve Ice Cream Maker would be great for my family! The ice cream maker for the family! My favourite is the Cuisinart Mix-It-In Soft Serve Ice Cream Maker – Nobody gets between me and my ice cream! I like the Demeter Vanilla Ice Cream Cologne spray because I love body products with the vanilla scent. 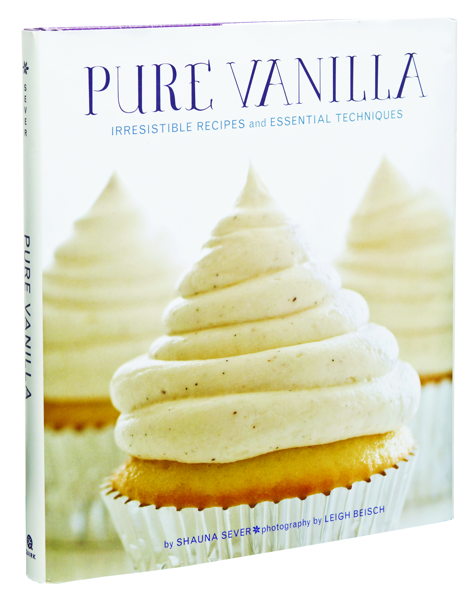 I love the “Pure Vanilla: Irresistible Recipes and Essential Techniques by Shauna Sever!” It would be for me and I would make wonderful desserts for my family! I scream we all scream for icecreamas they say. What an awesome gift to win I Love the Cuisinart Soft Serve Ice Cream Maker. ohhhh and it would be for me! The vanilla ice-cream perfume…and i gotta admit, it’s for me! I like the Best Ice Cream In Town Top idea and I would give it to my sister. I would like to be selfish for once in my life and say if I won it would be a treat for me. Lol! I can’t even decide … the pure vanilla perfume, the dress with the lace bottom or that snazzy ice-cream machine. It all sounds good!!! The Cuisinart Mix-It-In Soft Serve Ice Cream Maker; the three of us will enjoy this. Soft serve ice cream maker is my favourite idea. For either myself or maybe my family… if I am feeling generous lol. I think the soft serve ice cream maker is fun and my family would love it. I’m such a softie for ice cream so it has to be the Cuisinart Mix-It-In Soft Serve Ice Cream Maker (for me)! I scream for ice cream..it’s the best and would be for me! I would get the Demeter Vanilla Ice Cream scent for my mom! Vanilla is her favorite scent to wear and i bet this one is AMAZING!